Northern Ireland midfielder George Saville is relishing the prospect of battling with Juventus star Miralem Pjanic in Saturday's Nations League opener against Bosnia and Herzegovina. Pjanic and Roma's former Manchester City striker Edin Dzeko are the big names in the Bosnian squad. "We all play football to play against the best players in the world," said Middlesbrough man Saville, 25. "Pjanic is a great player. I'm really looking forward to the challenge." Saville linked up with the Northern Ireland squad last weekend immediately after agreeing a loan move from Millwall to Middlesbrough which will become permanent in January. The switch sees him joining a club in second place in the Championship table after an unbeaten start to the season. Boro's playing staff includes another member of the Bosnian squad Muhamed Besic after his loan to the Riverside Stadium club was extended by Everton last month. Five-times capped Saville has not yet met Besic or any of his new club-mates as his move was only confirmed last Friday - shortly before he joined up with the Northern Ireland squad. "Millwall have been a club that have been really good for me but at this stage of my career, and given the interest Middlesbrough have showed in me, I couldn't turn it down," Saville told BBC Sport Northern Ireland. But for the moment, all Saville's attentions are being focused on Northern Ireland. Surrey-born Saville, who came through the Chelsea Academy before spells at Millwall (three), Brentford, Wolves and Bristol City, made his Northern Ireland debut in the World Cup qualifier against Germany a year ago. 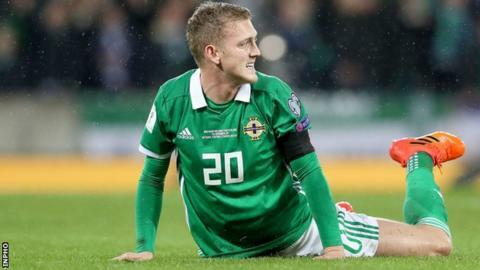 He has gone on to make four further appearances for Michael O'Neill's squad which included starting in the World Cup play-off second leg against Switzerland as he replaced the suspended Corry Evans. The Camberley native produced an impressive display that night as a 0-0 away draw saw the Northern Irish missing out on qualification following Switzerland's 1-0 first-leg win courtesy of the penalty incorrectly awarded against Evans for handball. Saville also started in the 2-1 friendly win over South Korea in March before missing out on the summer Central American tour when O'Neill's side drew 0-0 with Panama and lost 3-0 in Costa Rica. "I've loved it from the first day I've come in," says the Camberley native. "The manager has put a huge amount of trust in me and made me feel wanted. The boys are brilliant as well. "It's just shy of a year now I've been involved and I have loved it and look forward to it every time I come away." Saville says the early games in the World Cup finals in France "were a difficult watch" as the reality of what Northern Ireland were missing really kicked in. "We were that close to getting there. It was hard to take and watching a couple of games in the World Cup was uncomfortable but that's been and gone now and the main focus now is qualifying for the Euros." The Middlesbrough says he has got his head around the format for the new Nations League competition, which is aimed at reducing the amount of meaningless friendlies played during international breaks. "It's another route into getting into the Euros. "The focus is on qualifying through the group stages of the Euros but if that doesn't work out, there is a backdoor way of getting in so it can only be a plus for the smaller countries."